After 28 years group Laibach returns to the PM Gallery in Zagreb, at which, because of political pressures, their 1983 exhibition was interrupted and closed after only three days of viewing. The Croatian public will have the chance to see, for the first time, in all the gallery venues of the the Croatian Artists’ Centre, in the visual form of this extensive retrospective exhibition, the key poetics of their development (the collective, the anonymous, appropriation, over-identification, retro-avant-garde principle, quotation, remake, collage, recontextualisation…) from their first decade, the 1980s, until the present day. The exhibition will show the most important phases of the development of this visionary group from the early 80s onwards, presented through multimedia installations, oil paintings, prints, photographs, video, sound, printed media, manifests and documents. 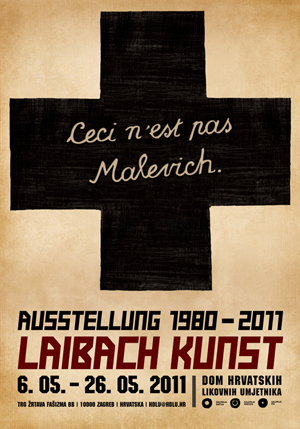 At the opening, Laibach members will put on a short sound performance. Laibach’s solo concert show in relation with the current exhibition in Zagreb will happen on May 21st in the Boogaloo venue (ex. RANS Mosa Pijade venue, where Laibach held their famous incriminated Music Biennale show in 1983)!